A three hour drive south of Tampa you’ll find one of the most unique eco-systems on the planet. Florida’s Everglades, the world’s only river of grass, still present a wildlife spectacle difficult to comprehend without a visit. No trip to Florida would be complete without seeing this natural wonder of the world. My first look at Everglades National Park I saw a vast plain of sawgrass, punctuated here and there by stands of pines, oak and palm trees. Those, I would learn, are called hammocks and represent places slightly higher in elevation than the rest of the table-flat terrain. While it looks like a massive swamp, the Everglades is actually a river that flows from Lake Okeechobee in central Florida through the Kissimmee River basin, then down through the mangrove estuaries of Biscayne Bay, Florida Bay and the Ten Thousand Islands. The river is about 60 miles wide and 100 miles long. The upper third is a freshwater marsh and sawgrass region, the middle portion is a mangrove estuary (combining salt and freshwater) and the lower third is Florida Bay, which is made up of seawater. The depth varies from a foot or two to mere inches. A host of species, many of which are found nowhere else in the world, inhabits the Everglades including Florida manatee, dolphins and sea turtles, as well as the endangered Florida panther, American alligators and American crocodile. The Everglades is the only place in America where crocodiles and alligators co-exist together in the wild. The unique network of swamps, rivers, prairies, ponds and large pools of water, create ideal living and nesting environments for a large variety of birds. Bird Watching enthusiasts can expect to see Osprey, Sandhill Crane, Great Blue Heron, Roseate Spoonbill, Snowy Egret, Great Egret, Common Moorhen, White Ibis, Reddish Egret, Bald Eagle, Pelican, Wood Stork and Red Tailed Hawk, to name a few. 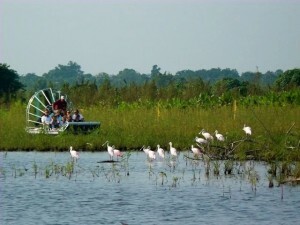 There are a variety of ways to explore the Everglades. Some prefer to become one with nature and hike along designated trails or push through unmarked acreage. Conditions vary seasonally, which means you could be tramping through waist-deep waters. By March or April the grasslands are sufficiently dry enough to allow for mostly dry walking, but most visitors are too timid to don wading boots and take their chances of wandering into an alligator or snake. Another way to explore is by canoe. 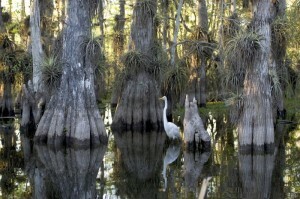 The Everglades contain hundreds of miles of canoe trails. This method is not only physically challenging, but it can be easy to get lost as well. 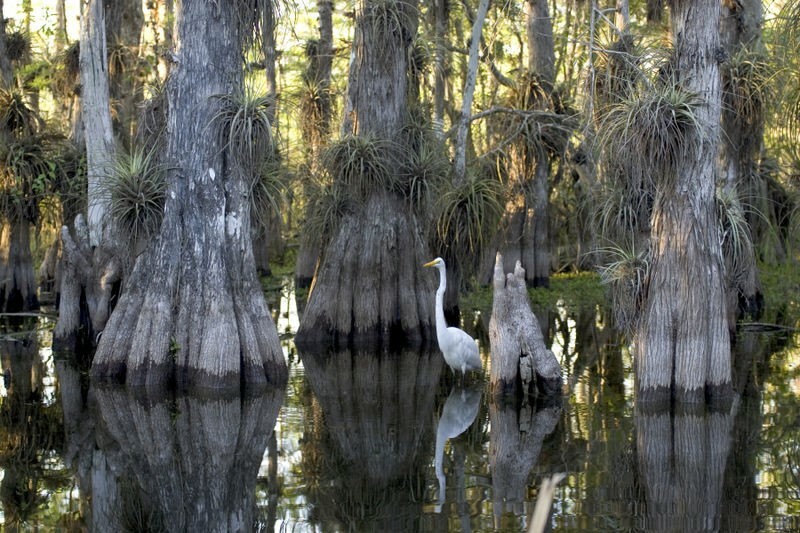 Guided tours are the easiest way for most visitors to experience the wild parts of the Everglades. On my last visit, I took a half day tour with Everglades Excursions out of Naples. If you are staying in Naples, you will be picked up at your hotel. Otherwise, you will start the tour at Experience Naples visitor’s center. My tour began with an informative drive in a comfort-controlled tour bus, driven by an experienced eco-trained guide who provided informative narration throughout the tour. The stories and history of the area began as soon as we were under way. Thirty minutes after leaving Naples, we entered Everglades National Park. Our guide pointed out native fauna and flora along the way. Other sights of interest included the Miccosukee Indian Village, a living museum and cultural center for the Miccosukee Tribe of Florida and the smallest post office in the country, only seven feet wide by eight feet deep. Yes, it is a working post office filling all postal needs for the community and visitors. From there we took an hour long airboat ride through the unique 10,000 islands expanse. In my opinion, this is the best way to see the Everglades. The rides are smooth, not bumpy or splashy as some would expect, almost as if you were gliding on the water. While on the ride you will catch hints of different aromas, including the sweetness from the basil trees and a soft grass smell from the freshwater river. Our guide began rattling off the names of birds and animals that were nesting, wading or soaring overhead. Some included the snowy egret, the great blue heron with its blue and gray feathers and eagles. Of course, when he pointed out the alligators, that got people leaning over the sides of the boat, aiming their cameras. We pulled into a secluded cove and the guide made a whistling sound and within seconds, an 8 foot long gator glided along side our boat. He then made a joke about alligators being able to jump at least twice their body length and that got everyone in the boat squirming. Once the airboat ride was complete, there was an alligator exhibit with an opportunity to handle a small alligator. I couldn’t resist holding one of the gators. There is also an option of a full day tour. These tours include everything on the half day tours, plus lunch and a narrated jungle cruise through Everglades National Park. 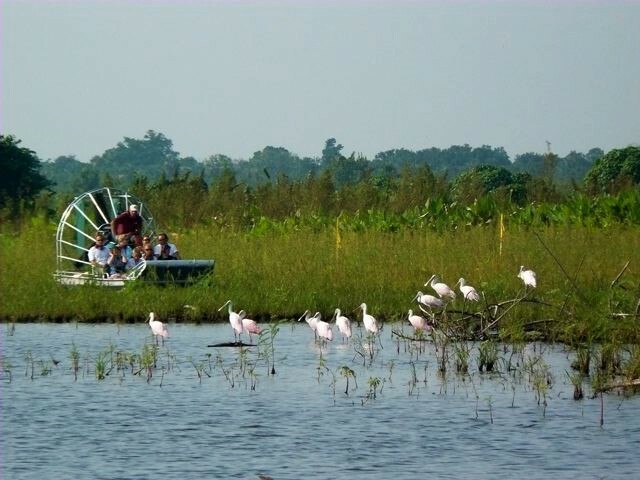 After the cruise, you will learn about the history of the Everglades and Everglades City. Tours include visits to either the museum of the everglades or Smallwood Museum. See and learn about Teddy Roosevelt’s, and many past President’s vacation retreat, the Rod & Gun Club, which is listed in the national register of historic places.